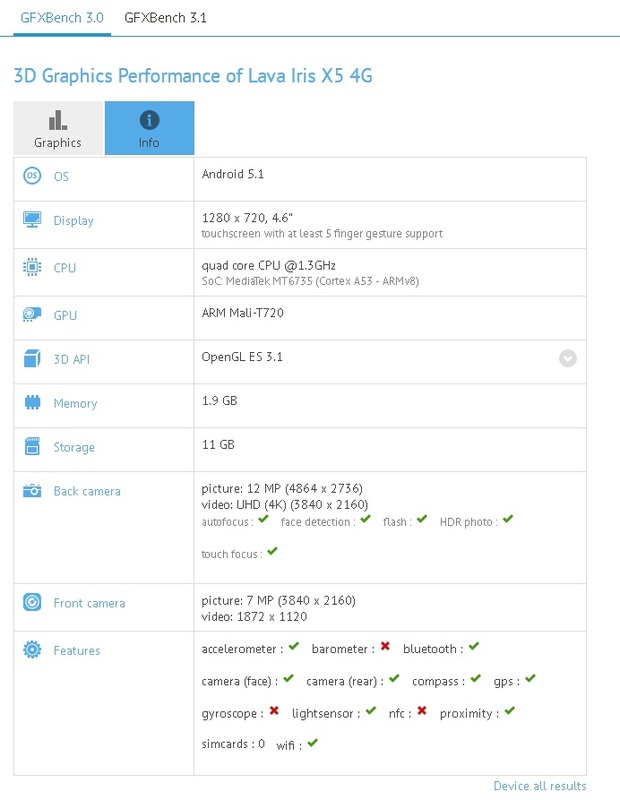 Lava Iris X5 4G has been listed on GFXBench, revealing some important specifications. Google has already announced that they have partnered with LAVA for their next and first 4G enabled Android One smartphone( 2nd generation) . If GFX Benchmark data is to be believe the Lava Iris X5 4G LTE features 2GB of RAM and is powered by 1.3GHz quad core processor based on Mediatek MT6735 chipset. It has ARM Mali T720 GPU and runs on Android 5.1 Lollipop. The phone comes with 16GB of internal storage. The Iris X5 4G has 4.6-inch 1280 x 720 pixels display with 5 finger multi touch support. It has accelerometer, compass, light sensor and proximity sensor. The listing also reveals the 12MP rear camera and 7MP front shooter. Other features are WiFi, Bluetooth, GPS and micro USB. There is no official confirmation about the device specs yet. Considering the specifications it could be launched under 10000 in India. The Lava Iris X5 LTE would give tough competition to Lenovo K3 Note, Xolo Black, Yu Yureka, Yu Yuphoria, Coolpad Dazen 1, Lenovo 6000 plus, Huawei Honor 4x, Xiaomi Redmi Note 4G and Asus Zenfone 2 Ze551ml all these smartphones are 4G enabled and comes with 2GB of ram.